Advance Tabco SL-GS-24 Stainless Steel Recessed Bar Drainboard - 24" x 23"
Expedite the glassware cleaning and drying process within your bar with this innovative Advance Tabco SL-GS-24 stainless steel recessed bar drainboard. This unit can hold multiple tiers or glassware thanks to a recessed embossed and seamless drainboard with a 1" IPS drain. Additionally, a 4" backsplash is paired with two side splashes to help protect nearby walls and floors from liquid spills. 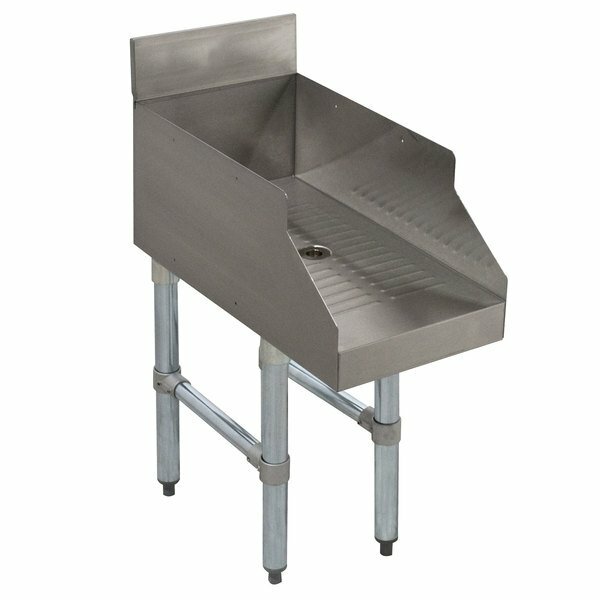 A durable and efficient design makes the Advance Tabco SL-GS-24 bar drainboard the perfect addition to your restaurant or bar. Overall User Rating: Advance Tabco SL-GS-24 Stainless Steel Recessed Bar Drainboard - 24" x 23"
After nearly 2 months, I am excited to be finally getting all of the 3-4 pieces that come with this sink. Came in bent and dinged up. DO NOT BUY!! Normally this website does good, but how frustrating to be sitting here with a dinged up sink that gets different parts sent every 2 weeks, and finally they might get it right. Advance Tabco none the less. Thank you for your review! We are sorry that the sink you purchased arrived with damages. Rest assured, a Customer Solutions Representative will contact you shortly to help fix the issue.